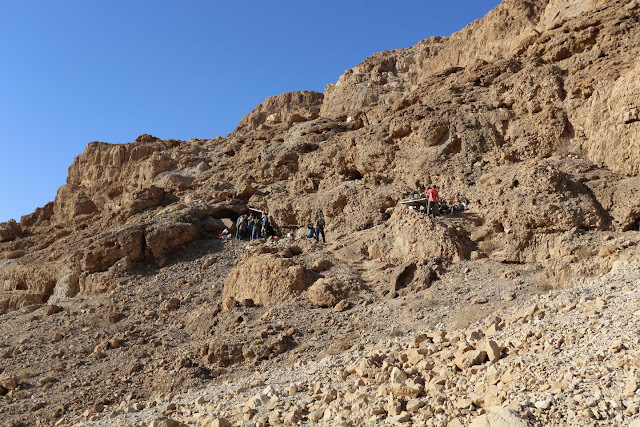 Excavations in a cave on the cliffs west of Qumran, near the northwestern shore of the Dead Sea, prove that Dead Sea scrolls from the Second Temple period were hidden in the cave, and were looted by Bedouins in the middle of the last century. With the discovery of this cave, scholars now suggest that it should be numbered as Cave 12. The surprising discovery, representing a milestone in Dead Sea Scroll research, was made by Dr. Oren Gutfeld and Ahiad Ovadia from the Hebrew University of Jerusalem’s Institute of Archaeology, with the collaboration of Dr. Randall Price and students from Liberty University in Virginia, USA. The excavators are the first in over 60 years to discover a new scroll cave and to properly excavate it. A piece of parchment to be processed for writing, found rolled up in a jug, in a cave on the cliffs west of Qumran excavated by Hebrew University archaeologists. Excavation of the cave revealed that at one time it contained Dead Sea scrolls. Numerous storage jars and lids from the Second Temple period were found hidden in niches along the walls of the cave and deep inside a long tunnel at its rear. The jars were all broken and their contents removed, and the discovery towards the end of the excavation of a pair of iron pickaxe heads from the 1950s (stored within the tunnel for later use) proves the cave was looted. Until now, it was believed that only 11 caves had contained scrolls. With the discovery of this cave, scholars have now suggested that it would be numbered as Cave 12. Like Cave 8, in which scroll jars but no scrolls were found, this cave will receive the designation Q12 (the Q=Qumran standing in front of the number to indicate no scrolls were found). Fault cliff and entrance (on the left) to a cave near the Dead Sea, excavated by Hebrew University archaeologists, who designated it the 12th Dead Sea Scrolls cave. The finds from the excavation include not only the storage jars, which held the scrolls, but also fragments of scroll wrappings, a string that tied the scrolls, and a piece of worked leather that was a part of a scroll. The finding of pottery and of numerous flint blades, arrowheads, and a decorated stamp seal made of carnelian, a semi-precious stone, also revealed that this cave was used in the Chalcolithic and the Neolithic periods. 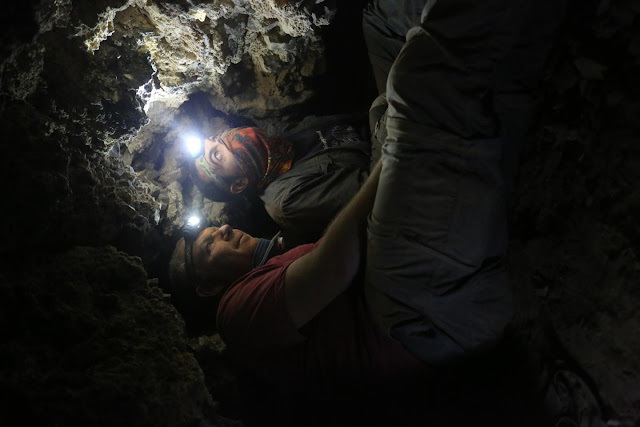 Archaeologists Oren Gutfeld and Ahiad Ovadia, from the Hebrew University’s Institute of Archaeology, survey a cave that once contained Dead Sea Scrolls. This first excavation to take place in the northern part of the Judean Desert as part of “Operation Scroll” will open the door to further understanding the function of the caves with respect to the scrolls, with the potential of finding new scroll material. The material, when published, will provide important new evidence for scholars of the archaeology of Qumran and the Dead Sea caves. 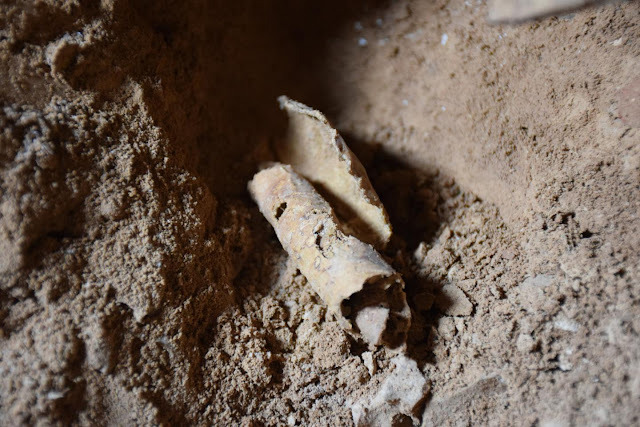 “The important discovery of another scroll cave attests to the fact that a lot of work remains to be done in the Judean Desert and finds of huge importance are still waiting to be discovered,” said Israel Hasson, Director-General of the Israel Antiquities Authority. “We are in a race against time as antiquities thieves steal heritage assets worldwide for financial gain. The State of Israel needs to mobilize and allocate the necessary resources in order to launch a historic operation, together with the public, to carry out a systematic excavation of all the caves of the Judean Desert.